You buy or rent M4V movies from iTunes Store and want to play them on iPod overpass DRM protection? What you need is M4V converter Plus, it can convert DRM M4V files to unprotected M4V formats, and then you can play it on any iPod freely. M4V Converter Plus is a powerful M4V DRM Removal tool. It converts M4V videos to MOV format in high speed with great quality. It is designed to convert DRM M4V video you purchased to QuickTime MOV, iPod, iPhone format. Moreover it can also convert almost all video formats could be played on your iTunes to other common video formats like MOV, MP4 or unprotected M4V. Step-by-step guide to convert M4V to MP4 for iPod. 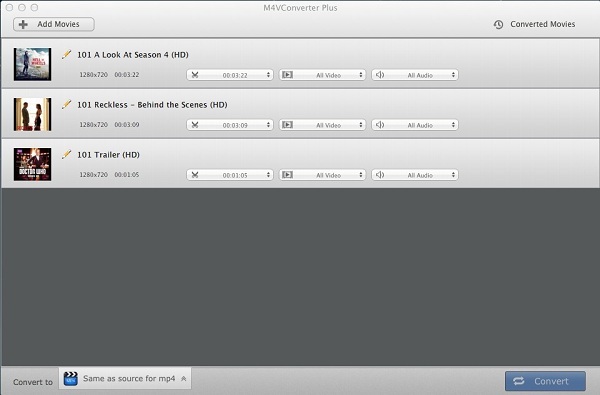 Free download this M4V Video Converter, install and launch this M4V Converter. Click "Add Movies" button, search your DRM M4V files according name, then select the files, click "Add" button. Step 2. Select output format and output folder. In the output presets, select "For iPod (*.m4v)" in profile drop-down list. Tip: If you choose "For iPod (*.m4v)", the output video is for iPod, and the video maximum size is 640*480. You can press "Convert" button or click the menu Control->Start Converting to start the converting, and now the converting process begins. After the converting process finished, you can select one of these video files, and then play it to view video effects whether it is satisfied. If you are not satisfied, you can re-customize the output setting to convert the video to other format to meet your need.